It is important to be the first one out in the morning. On this morning, Bo (orange, left) seems to have the advantage. He does not. 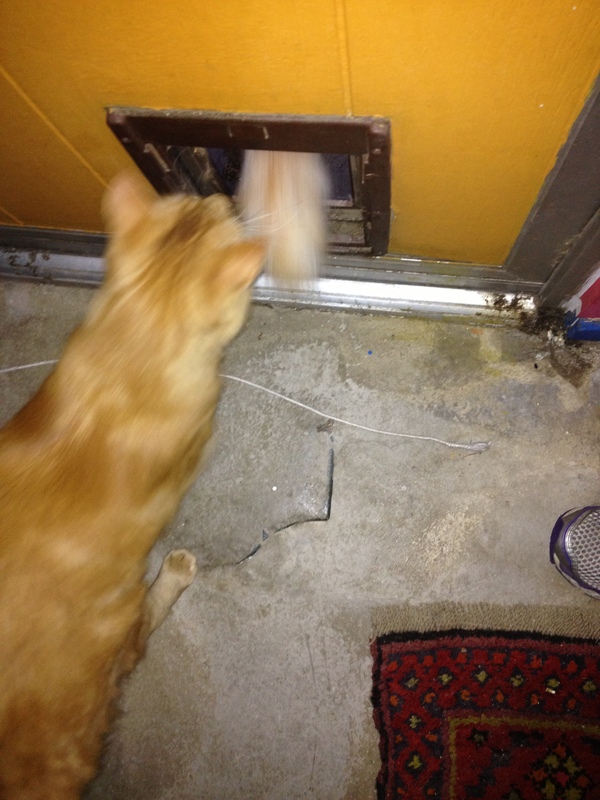 As soon as the cat door opens, Arrow will squeeze under his chin and shoot outside before he takes a step. I am a cat. 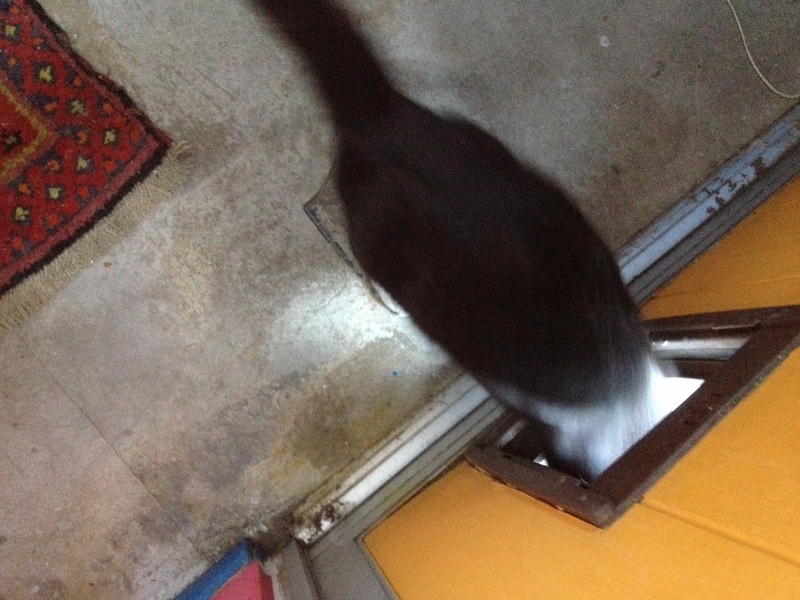 I pace and meow to exit, and then, soon after, I return to lounge indoors. Sometimes the pacing lasts longer than the trip outdoors. 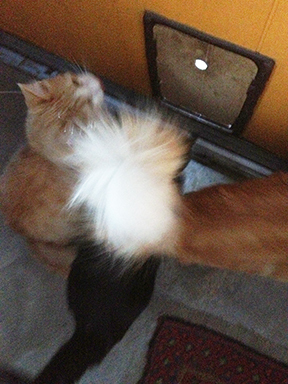 There are three cats here, Arrow is obscured by Leo’s bushy tail. Giant orange tabby Leo is usually third of the three to leave. He doesn’t get the fuss about the morning exits, but competes because his buds do. Didn’t we just do this yesterday? A rare photograph captures the exit of the usual winner. Arrow does everything at warp speed. This morning, the others haven’t yet realized the door is open by the time she is outside. P.S. 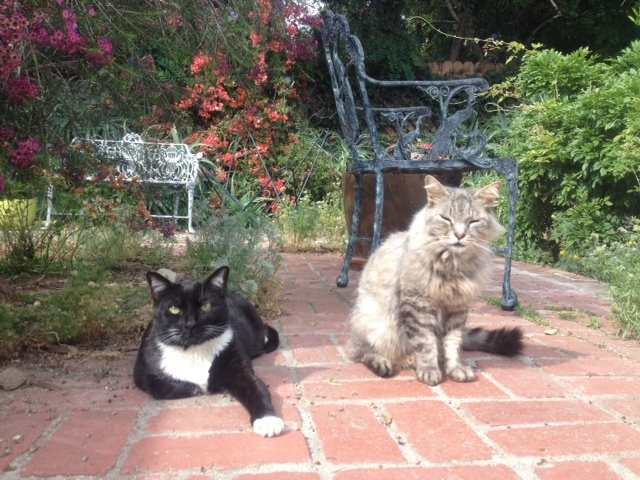 to discerning blog readers – yes, these photos are missing two of the five cats. 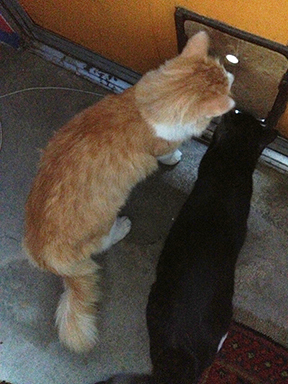 The youngsters use this cat door to the backyard. The oldsters prefer to leave by another door. Oldsters Bop and Luna avoid the youngsters at rush hour.